A blue-colored Dottyback with numerous yellow dotted lines running longitudinally through the body. A black stripe is sometimes seen running through the operculum. 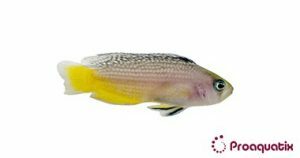 The caudal fin is yellow. Manonicthys splendens is a carnivore of worms and other small invertebrates. Range extends from Flores, Moluccas, and Irian-Java southward to northwest Australia. This species is aggressive towards conspecifics and other species within their territory.